3for2 Promo. Stay 2 nights and get the 3rd free, for all stays October 15th through May 15th. All other terms and conditions apply, excludes all holidays. Select 3for2 promo at booking, or if booking through VRBO we will apply it when we confirm the booking. This is an amazing home, designed by Michael Barron-Wike AIA, to maximize the views and still fit into the hillside. Serendipity has the Craftsman look, inside and out. The first impression when entering is of a/ wonderful combination of windows and wood; 34 Anderson windows, five skylights, Brazilian Cherry flooring, maple custom cabinets, high open beam ceilings, rich Cedar trim, and Mission style furniture. The great room provides breathtaking views. Looking through the huge picture window, one can see the Gualala River, the beach, the Gualala Point Cliffs, and the crashing waves. The house is a feast for all the senses. The ocean sound is always present, birds of all types fly by, and seals play below. We have seen whales relax below us for hours. Mid-April to mid-May is the peak whale season. The mother and baby grey whales hug the coast on their way north from Baja. They love to stop and rinse the barnacles off in the fresh water of the river mouth below our house. The last few years we have seen Humpback whales in the fall and Bald Eagles year round. Although you cannot see the town, all of this is a short walk from many wonderful restaurants, shops, galleries, and stores. Most of our guests choose to eat at home, however. The view cannot be beat, and the kitchen is beautiful - Granite counters, top end appliances, and fully-equipped including an ice cream maker/. The house was lovingly built by Gregg Warner and a many other local crafts-persons. It incorporates luxury with environmental concern. We used concrete shingle siding, composite decking, and sustainably grown hardwood flooring. We installed a four KW solar panel below the house, as well as a tankless water heater, and other energy efficient appliances. Serendipity was featured on the Soroptimist's Coastal Home Architectural Tour. Every step through the house offers another view, inside, or outside on either of the two decks. The two master bedrooms are on opposite ends of the house for maximum privacy for two couples, and the kids will love sleeping in the great room, either on the fold-out sofa with a plush comfort sleeper mattress, or the 18 foot wide window seat. The entertainment center is stocked with an LED Smart TV, DVDs and the drawers in the window seat are filled with games and toys. The spa captures river and ocean views, stunning at sunset. We offer free wireless internet connection, as well as unlimited free U.S calls, so stay an extra day and work from the deck. Until you start yelling when you see one, nobody has to know you have been whale watching while working. As you can tell, we love this house, and judging from the glowing comments in our guest book, you will too. 11% bed tax, plus cleaning and reservation fee will be added to the Daily and Weekly base rates shown on the blue Rates tab (next to Availability). For a quick-quote, simply click on the blue Availability tab for the date and number of nights you want to stay, and you'll see the complete package presented. If you prefer, please call our office for personal attention. We absolutely loved our stay. The house was even better than the photos. The house was stocked with everything you could possibly need to cook or relax. The management were very helpful also. We would definitely like to return! We are glad to hear you found everything you needed (and then some) and would definitely like to have you back!! Fantastic property with all the amenities and beautiful views! We enjoyed starting the day in the hot tub watching the bald eagle pair in the tree just outside our bedroom; and ending the day back in the hot tub stargazing and sipping a glass of wine; then falling to sleep in our oh so comfy bed! We went wine tasting in the Anderson Valley for some fantastic Pinot Noirs. Even though it is a trek over there, the views on the drive up the coast are nice and the windy roads through the forests are pretty as well. We took full advantage of the well stocked kitchen for breakfast each day and the Weber grill for Prime steaks purchased at the grocery store, just minutes away. I will warn you, though, you will not want to leave! Thank you for sharing your wonderful vacation experience at our Serendipity home. Coasting Home is proud to have this home on our program and always love to hear about the guests who find respite when coming here. This home does the trick every time! And we often hear people upset that it is time to go home. Gorgeous vacation home. A plus in all respects. Unbelievable treat to stay here. Light, clean, well-equipped and spacious, with decks and views at every turn, and a bald eagle in a tree on site. Thank you for a lovely few days. We want to return! This home is an easy favorite for many of our guests. It does book up quick though! Can't wait to have you back! Beautiful house and setting. The owners provided everything our family of 5 needed to spend six relaxing days on the north coast. 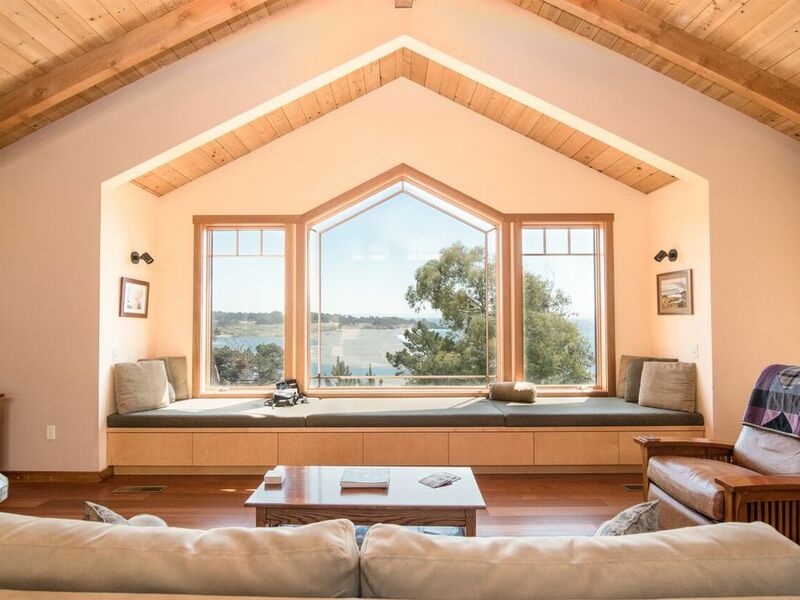 The house's design provides views of the Gualala River and Pacific Ocean from every room. We enjoyed watching the bald eagle pair that perched in the trees each day, and also saw deer, otters and sea lions. The kitchen is fully stocked with every appliance, utensil, etc. needed to cook elaborate meals. Town of Gualala is walking distance for grocery shopping and restaurants. Golf course and Point Arena Lighthouse within driving distance. What a great place to spend the holidays with family! It sounds like your family had a magical stay at Serendipity over the Holidays. We hope to have you back again soon. This house is amazing and we send thanks to the owners for sharing such a special place! Very well furnished. All expectations were exceeded and we had a memorable weekend in a lovely location. Hope to return! The owners of this home truly take great joy in knowing how magical this home is for everyone. We hope to have you back again soon. Have rented many vacation homes in Gualala, Sea Ranch and Irish Beach. This one is THE BEST. I have never been in a better equipped vacation rental. It was spotless. We enjoyed the huge deck. Saw a whale a couple of times in the late afternoon. This is a good house if you want to cook. Nice layout and tons of tools to use. Clean BBQ. Had a bunch of deer that would stop and eat the grass each day. As many as 7 one day. One little problem was ants. Bit pesky but we all had a wonderful time and cannot wait to return. We are pleased that you enjoyed your stay with us! And that you were able to see whales on your visit here! !